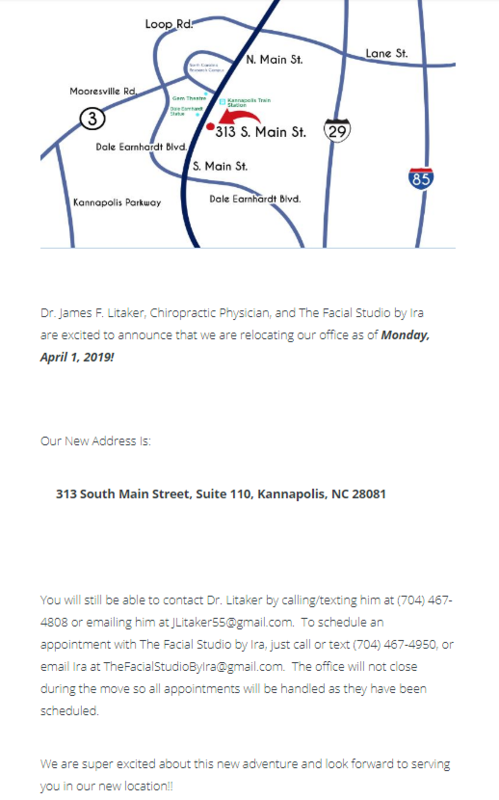 Dr. James F. Litaker, Chiropractic Physician, is Moving! Dr. James F. Litaker and the Cabarrus Chiropractic Clinic staff are here to treat all of your wellness and spinal care needs. Our office is equipped with the necessary equipment to perform optimal chiropractic techniques and our staff is caring, compassionate, and results-driven. We are located in Kannapolis and serve the entire area, including Concord, Mooresville, Landis, China Grove, Rockwell, Mount Pleasant, Harrisburg, Davidson, Salisbury, and Huntersville. If you want to look as great as you feel, Dr. Litaker has the answer for you! The Facial Studio by Ira is a facial studio tucked within Cabarrus Chiropractic's offices that offers regenerative anti-aging treatments in addition to care for skin conditions such as acne, rosacea, hyperpigmentation, and much more. If you are interested in learning more about how your lifestyle can help improve your skin, along with receiving effective treatments, schedule a session with Ira. If you and your family are in need of chiropractic care in the Concord/Kannapolis/Charlotte, NC area, Dr. Litaker is here to meet those healthcare needs. Cabarrus Chiropractic Clinic specializes in one-on-one personalized care. Dr. Litaker's treatment style is centered on the needs of the patient and their desired outcomes. Dr. Litaker is very results-driven and is dedicated to providing his patients with effective care. The office participates in all major insurance programs, and is also a proud participants in the Community Veterans Choice Program. We are dedicated to meeting the needs of our patients and are here to help! If you are interested in learning more about how chiropractic care can help you lead a pain-free life, we are here for you! If you have recently been in a car accident or have suffered any type of injury, we can help. Please call the clinic today at (704) 467-4808 to schedule a consultation. Our office is conveniently located at 313 South Main Street, Suite 110, Kannapolis, NC 28081. Dr. James Litaker is a Kannapolis chiropractor who serves Kannapolis and the surrounding communities in NC . Dr. James Litaker grew up in Concord, NC, graduating from Northwest High School and Catawba College. 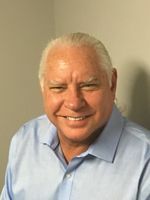 He went on to receive his Doctor of Chiropractic degree from Palmer College of Chiropractic Medicine, whose faculty is known for being leaders in their prospective fields. In addition, Dr. Litaker has completed postgraduate work in nutrition, rehabilitation and acupuncture medicine.